Marathoners are, in this coach’s opinion, distance runners of the purest form. The event, itself, along with its more time intensive and aerobically-based training, tends to attract those who enjoy the process as much as (if not occasionally more than) the outcome. As a result of this passion for greater time on feet, shorter events are often the first to be discarded in marathon preparation. Instead, you should consider 5K and 10K distances as effective tools as you plan your next marathon cycle. A typical marathon phase consists of a minimum 9-11 week build-up for “crash course” programs and as much as 16-20 weeks for athletes in need of more preparation. However, it is within the 6-12 weeks preceding this marathon build-up period which I highly recommend scheduling four to five shorter 5K and/or 10K races. By leading into your marathon phase with this shorter, higher intensity racing period, you will improve both your physiological and your biomechanical efficiency—as well as your body’s ability to consume O2. Additionally, time on the “bottom end” of distance running events prior to marathon training will make marathon rhythm pacing sessions—and even race day itself—feel much easier after having come into more aerobically-based training with some of the power, VO2 and quicker threshold-based work associated with 5K preparation. 5K and 10K races are outstanding vehicles for the steady tempo-based efforts you already have planned as part of your normal marathon build-up. 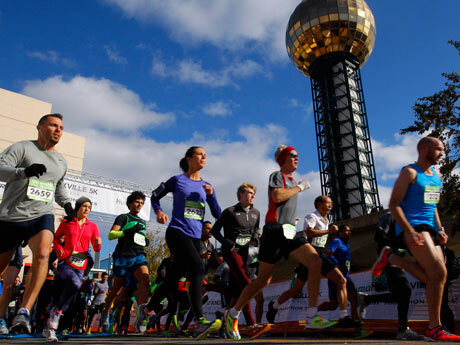 Does your marathon schedule call for a 5K or 10K “moderate” tempo effort? Rather than gearing up for that tougher effort on your own, try using a local 5K/10K race as an alternative to the normal Saturday morning tempo routine. While spending $20-30 on entry fees for races that are simply being used as a workout may seem unnecessary, perceived effort is always lowered in a race setting, giving you a more effective workout than most you could create by yourself. Additionally, using races as marathon prep tempo efforts gives you the added benefit of having on-hand fluid and even energy for marathon practice.